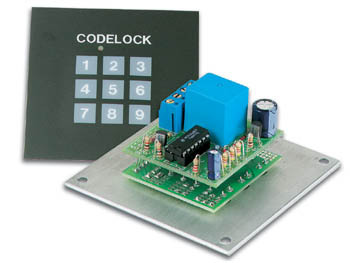 This code lock may be used to switch an alarm (e.g. car alarm) on and off, or to open a door lock. An LED on the operating panel indicates the position of the 'lock'. The code is easy to define. Because the operation panel is completely enclosed, it may be used inside and outside the house. dimensions: front panel : 3.2" x 3.2", depth : 1.6"